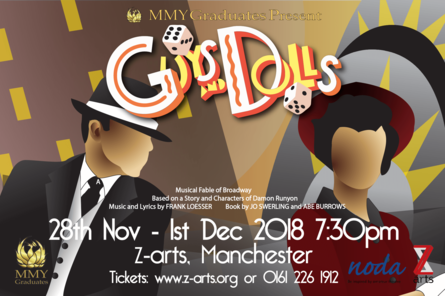 Following off the back of their sell-out success of RENT, MMY Graduates are back with a touch of class with the 1950s musical comedy Guys and Dolls. Frank Loesser’s musical is about rolling the dice and falling in love under the bright Manhattan lights. A slick and hilarious tale of the most unlikely of New York city pairings: Sky, a high-rolling gambling ladies’ man, meets Sarah Brown, a defiant and highly strung missionary girl. Meanwhile ditzy showgirl Miss Adelaide dreams of the straight and narrow life with her wily fiancé Nathan Detroit who is anything but! A journey that takes you from the heart of Times Square to the bars of Havana, Cuba; Frank Loesser’s brassy and timeless score will transport audiences to the swinging 50’s! Featuring hits such as Luck Be a Lady, I’ve Never Been In Love, Take Back Your Mink, and of course Sit Down You’re Rockin’ The Boat. This award-winning creative team and company will be rockin’ the boat and ringing the bells with this all time classic.